This is simple to prepare. You only need fresh Baguio beans, ground pork, garlic, onion, salt, pepper, water and oyster sauce. Pour a cup of water in a skillet and let the ground pork simmer for several minutes to lessen the malansang amoy ng meat. Add salt and pepper when the water dries up and the ground pork turns brown. Set aside the ground pork leave a small amount of oil in the pan to saute the garlic and onion. Return the ground pork to the pan and add the green beans. Mixed well. Add half a cup of water. Simmer for a few minutes before adding the oyster sauce. Simmer until the beans soften. This dish is best paired with steamed white rice. Enjoy! 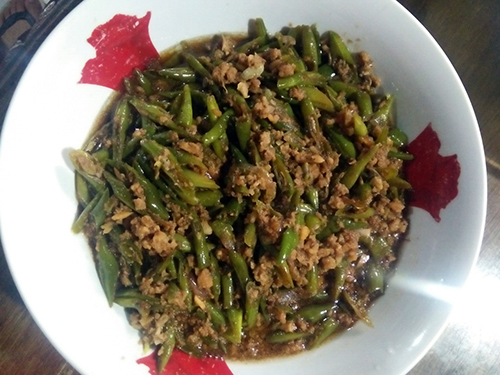 This entry was posted in Healthy food, Recipe and tagged Green beans, healthy cooking, oyster sauce, vegetables on January 12, 2019 by Yami.